Pope Francis begged for God’s forgiveness for the “sins” by members of the clergy. THERE HAS BEEN criticism again today of the pope’s comments about clerical abuse in his Knock Shrine speech. Pope Francis addressed the crowd at the shrine earlier today, telling them that in his silent prayer to the statue of the Virgin Mary, he presented to her all of the victims of abuse committed by members of the Church in Ireland. “None of us can fail to be moved by the stories of young people who suffered abuse, were robbed of their innocence and left scarred by painful memories. This open wound challenges us to be firm and decisive in the pursuit of truth and justice,” he said. I beg the lord’s forgiveness for these sins and for the scandal and betrayal felt by so many others in God’s family. I ask our blessed mother to intercede for the healing of the survivors and to confirm every member of our Christian family in the resolve never again to permit these situations to occur. Yesterday the pontiff met with eight survivors of clerical, religious and institutional abuse, including Paul Redmond of the Coalition of Mother and Baby Home Survivors. He said the pope had apologised for what happened in the Church-run homes and condemned the corruption and cover-up as “caca”, translated as “filth one sees in a toilet”. 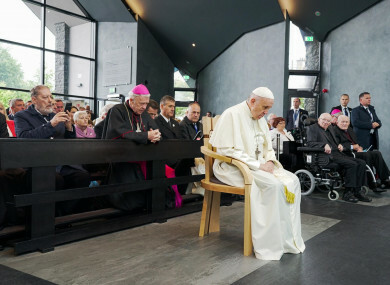 The pontiff also addressed the issue of clerical abuse in his keynote speech at Dublin Castle yesterday, commenting that be could not fail to “acknowledge” the scandal. Abuse survivors pointed out he did not apologise to them publicly and he did not mention the overall responsibility of the Church in relation to this abuse. There was similar criticism of the pope’s address this morning, including his choice of the word “sins” in referring to acts of child sexual abuse. Abuse survivor Colm O’Gorman pointed out that, again, the pope did not mention accountability “or the Vatican’s responsibility for directing the cover up of these crimes”. It's so easy to say that the original crime was horrible, indefensible etc. I think we're past the point where apologising for the abuse is an issue. The point now is that the complicity and cover up that allowed the abuse to continue still haven't been properly addressed. O’Gorman has organised an event at the Garden of Remembrance to support abuse survivors. It will coincide with this afternoon’s mass in the Phoenix Park at 2.30pm. Artists including Hozier, Roisin O from Thanks Brother and Liam O’Maonlai who will perform on stage. The people gathered will walk silently to Sean McDermott Street to the last remaining Magdalene Laundry in the possession of the State. Email “'No mention of accountability or cover-up' - Criticism of pope's Knock Shrine speech on clerical abuse”. Feedback on “'No mention of accountability or cover-up' - Criticism of pope's Knock Shrine speech on clerical abuse”.